The church in Philadelphia has partnered with Bibles for America to offer free copies of the New Testament to our friends, neighbors, and fellow Christians in Philadelphia. Bibles for America is a non-profit organization whose mission is to distribute free copies of the New Testament Recovery Version and Christian literature throughout the United States. 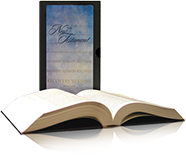 The New Testament Recovery Version is one of the most comprehensive study Bibles available today. Click here to receive your free copy of the New Testament.